Thomas Jefferson built his home, Monticello, in this area of Charlottesville, Virginia. 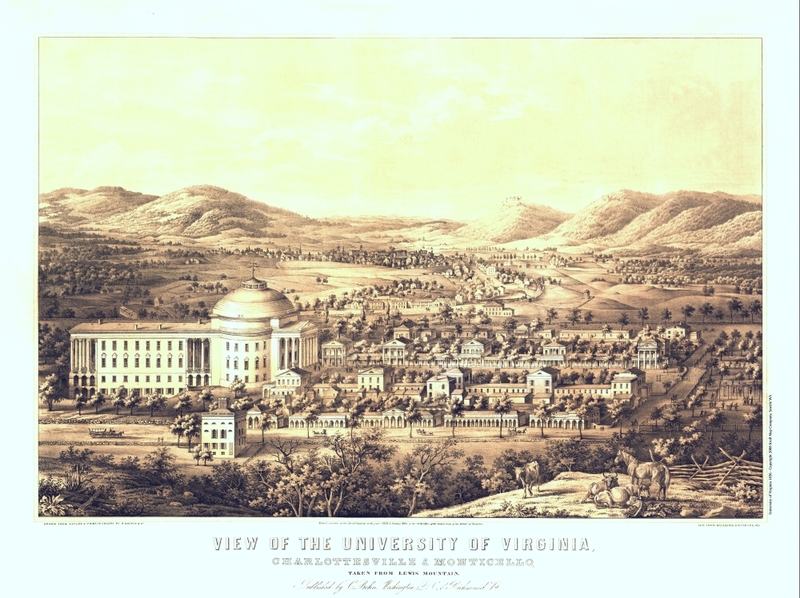 Although he later founded the University of Virginia, it was not-yet built when Tom and Patty Jefferson moved to Monticello. This view, circa 1856, depicts the general "lay of the land" of Monticello and its surrounding areas. Image online, courtesy Library of Congress. As concerns about British intentions for the colonies increased, Rhode Islanders burned a British ship (the Gaspée) which had enforced unpopular trade regulations against the colonies. Communication about such events, for people living in a three-mile-an-hour world, was not so simple. Several leading Virginians thought it wise to form Committees of Correspondence. Much lies behind this rather innocuous title. These committees - it was hoped - would form a network, monitoring British activities, assessing the legitimacy of British-imposed laws and sharing information as needed. Tom Jefferson wrote the resolution, on Committees of Correspondence, which Virginia's House of Burgesses put to a vote in March of 1773. Dabney Carr gave the speech which endorsed the plan. After the resolutions passed, twenty-nine-year-old Carr was one of ten men appointed to the colonies' first such committee. Two months after his speech, however, Dabney developed a serious fever and died in Charlottesville, the town closest to Tom and Patty's home. The unexpected tragedy happened just three weeks after the birth of his sixth child. Keeping a promise made to his best friend, Jefferson decided where to place Monticello's cemetery. Dabney's grave was the first of many which are now at the top of Tom's Mountain. About seven months after Carr's death, colonials pretending to be Mohawks boarded British ships in Boston Harbor. They had one objective in mind: Relieve the vessels of all tea. Successful in their mission, they dumped 342 containers of tea into the sea. The colonies were inching closer to full-fledged rebellion. Bos, Carole "BEGINNINGS of REVOLUTION" AwesomeStories.com. Jul 01, 2008. Apr 23, 2019.